What is known about the cultural significance, conservation and the opportunities for commercialisation of this extraordinary group of parasitic plants? 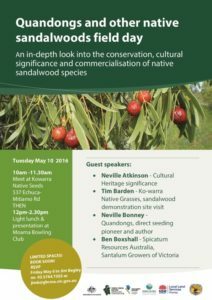 This free event is on Tuesday 10th May, 10:00 am-11:30 as advertised at Tim Bardens Ko-Warra Native Grasses 537 Echuca-Mitiamo Road. for 12:00 lunch and presentations until 2:30.